The LowCVP welcomes the announcement of the winners of the latest round of Ultra-Low Emission Bus funding which will provide £48m support for 263 ultra-low emission vehicles. The announcement (made by minister Nusrat Ghani at today’s UK Bus Summit in Westminster) builds on 10 years of partnership between the LowCVP, Government and industry stakeholders. It follows the series of Green Bus Funds (2009 to 2014) and the Low Emission Bus Scheme in 2015. This latest support for the UK’s thriving ‘green bus’ sector will help it re-establish its position amongst international leaders in the introduction of greener, cleaner vehicles. It will also help to create opportunities for locally-based bus manufacturers and component suppliers, as well as encouraging the best technology from international OEMs to be adopted in the UK. LowCVP’s Managing Director, Andy Eastlake, said: “The bus sector is showing the rest of the UK’s road transport sector the way when it comes to cutting pollution and emissions which cause climate change. The new funding will encourage the introduction of more vehicles with greater zero emissions range capability and even bigger benefits to both urban air quality and climate change. “Buses are rightfully a key target for policy and support as they are often chosen to operate in areas with the greatest air quality challenges. They provide a vital option for local authorities and operators now struggling to meet urgent air quality targets (such as London’s Ultra-Low Emission Zone and Clean Air Zones in other cities). “Consistent support over a long period of time has created great opportunities for the UK-based bus industry and the related industrial community. Electric buses can save up to 72% of the CO2-equivalent greenhouse gas emissions compared with a standard Euro V diesel buses (based on the 2018 UK average electricity grid mix). These savings will only increase as renewable energy provides a growing part of the UK’s electricity mix. There are four UK-based manufacturers of electric buses and two makers of hydrogen fuel cell buses. The UK industrial sector is also, therefore, well placed to benefit from the transition to cleaner, low carbon buses. 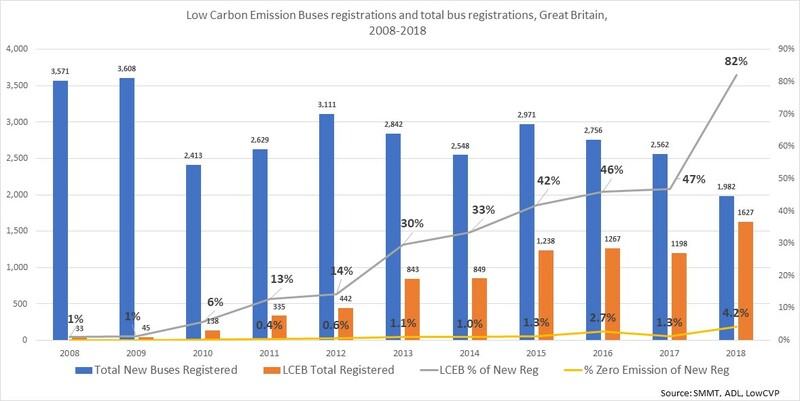 Support for low carbon, cleaner buses has been operating for over a decade. The 2009 Green Bus Fund was the first in a series of incentive schemes, targeted at buses, based on criteria developed by the LowCVP. The latest scheme is based on the most challenging requirements anywhere in Europe, including consideration of cabin heating, ambient air conditioning, whole-vehicle testing with ancillary loads and well-to-wheel greenhouse gas emissions. For more information on the Government’s ULEB announcement, visit this link.